Today is the Feast of the Immaculate Conception. It is also the day that Pope Francis opened the Holy Doors at St. Peter’s and declared this to be a year of mercy. In Italy, this day kind of kicks off the Christmas season, so it’s a special day here and a national holiday. This morning as we were getting started with our day, Steve asked me when the Jubilee Year starts. I said I thought sometime in December and a quick internet search uncovered that it was today and the ceremony started at 9:30. At that moment, it was 9:28, so we tuned our computers to Vatican TV and watched most of it. The timing of this struck me as a little more than coincidental. Here we are in Italy, on this day, and it pops into our mind about the Jubilee and we find out it happens in just two minutes. It was a beautiful ceremony and was filled with tradition and inspiration. Of course, it was all in Italian, but because the Pope speaks slowly and clearly for the people, we understood a good bit of it. 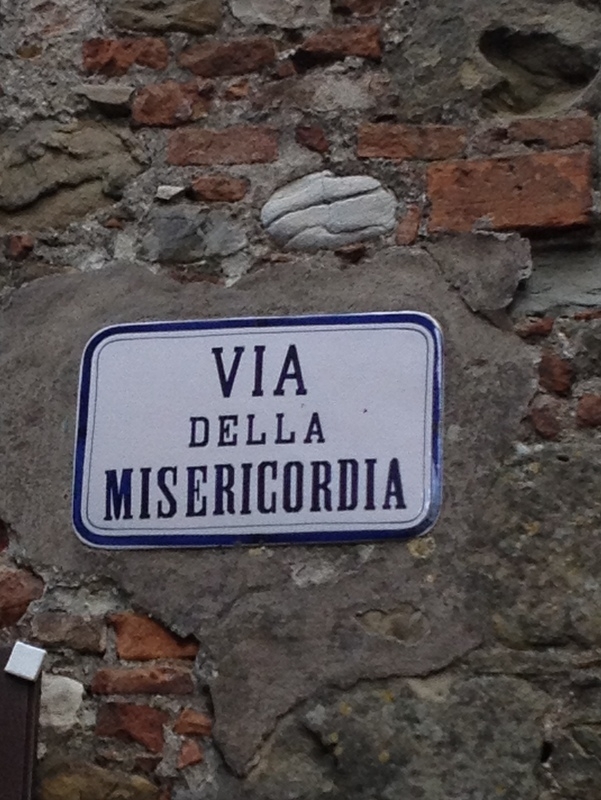 We heard the Italian word for mercy, misericordia, a lot. That stands to reason, since this Jubilee year is the year of mercy. Jubilee years are designated by the Pope and are not done very often. It’s really special occasion stuff. The Holy Doors on St. Peter’s are bronze doors that are sealed off except during Jubilee years. When I say sealed off, they are bricked over. No one is getting through those doors. During Jubilee years, the Pope opens the doors and they remain open all year for anyone to walk through. It’s a symbol of passing from the world into the presence of God. Mercy is a word we don’t use much in English. We most commonly associate it with the judicial system – where you plead for mercy or throw yourself on the mercy of the court. But maybe we should use it more, or at least use it as principle in our lives. We’re really good at judging and jumping to conclusions, but how good are we at empathizing? I know the Pope has a bigger agenda than just how we treat each other in our everyday lives, but maybe he thinks if we take one year to focus on this and how we can incorporate it into our lives, it could make a small difference. Hey, with everything going on in the world today, it’s worth a shot. We could use a big dose of something to start a movement toward peace and goodness. After we watched the Pope tap three times on the bronze Holy Doors and cross the threshold into St. Peter’s, we went for a walk. It’s a beautiful day here. The sun is out, it’s clear and the temperature is cool, but just right for being outside. We walked around town, looking at the Christmas decorations and the people all milling around on this special holiday. There was a festive feeling in the air. It was such a perfect day that we decided to take a drive and explore a little around the area. We drove down country roads and kept stopping in the road because the views were so tremendous. It’s hard to imagine that violence and destruction are taking place somewhere in the world at the exact moment we are sighing over an incredible view. But these things do exist side by side for no reason that we can understand. So today we will feast. A few days ago, I didn’t even know what the Feast of the Immaculate Conception was. Remember, I grew up Southern Baptist. But I’m here in Catholic Italy married to a Catholic man and we will feast. We will mark the beginning of the Christmas season, which promises to be a beautiful and wonderful thing here. We will also mark the beginning of the year of mercy and hopefully this time next year, the world will be a slightly more compassionate place. Perfecto! just lovely, thank you! Prego, Julie! As you know, it’s a magical place and made even more so by the magic of the season. We get so caught up in the rush and obligations that we don’t have time to enjoy it. It’s nice not to have any commitments – just taking each day and seeing the wonder and beauty. Love it!